Hello again my friend! Welcome to another sketch challenge with the Paper Craft Crew! Well, June 1st is the start of the new Stampin’ Up! Annual Catalogue, so you’re going to be seeing a lot of new products from now on – hopefully you’ll be getting lots of inspiration for what to order, and what to create with your new sets. In the stamp set, the bench is actually a swinging bench, suspended with ropes, but I just wanted mine to be on the ground, so I masked off the ropes, and stamped the bench in Soft Suede ink onto Whisper White cardstock. I used a combination of Sponge Daubers and Aqua Painters with Pear Pizzazz and Pool Party ink pads to create the grass and sky, and stamped the ‘shade/shadow’ image below the bench in Pear Pizzazz ink as well. I used my Blender Pen and Crumb Cake ink pad to colour in the bench, and Stampin’ Write Markers in Pool Party and Sweet Sugarplum to colour the bench cushion. 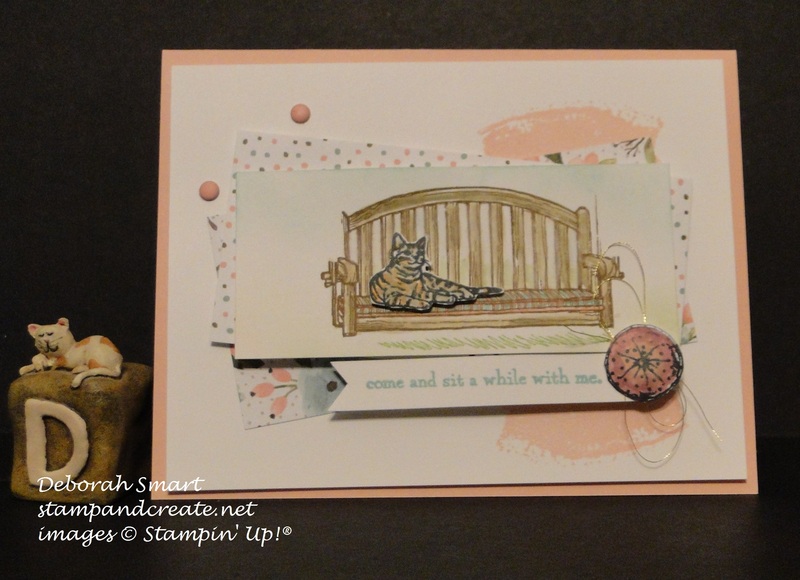 On a scrap piece of Whisper White, I stamped the cat in Memento Black ink, and used my Markers in Peekaboo Peach and Smoky Slate to create a sort of marmalade/tabby cat 🙂 I then fussy cut the cat with my Paper Snips, and sat him on the bench using Stampin’ Dimensionals. To put the card together, I started with a card base in Blushing Bride, and added a panel of Whisper White that I had stamped using the Work of Art stamp set brush stroke image, in Blushing Bride ink. I then attached two panels using 2 different patterns from the retiring Birthday Bouquet DSP. The sentiment is stamped on Whisper White cardstock in Pool Party ink, and added beneath the stamped image using Stampin’ Dimensionals. I then stamped the small pillow from the Sitting Here set in Memento Black, and coloured it using the Markers in Blushing Bride and the new Sweet Sugarplum. I attached some loops of Gold Thread behind the pillow and added it at the end of the sentiment. Two retiring Candy Dots in Blushing Bride completed the card. This is one of my favourite new stamp sets; as soon as I saw it in the new catalogue, I knew I was going to order it, so I was very happy to see it in the list of products that we demonstrators could pre-order. I hope you’ve enjoyed seeing my card; please be sure to check out what the rest of the Design Team have created for your inspiration, at the Paper Craft Crew page. Then create your own card, using new, current or retired products, and link up for the challenge! I’ll be looking for your card! Previous Previous post: Kick-Off Party Fun!